Awarded to a Club member for outstanding contribution to the St Croix Yacht Club during the year. Designed and constructed by a former Club member and Tiffany silversmith. Donated by the wife of dedicated yachtsman, Lawrence Carlson, this trophy is awarded for the best performance by a sailing vessel regardless of class. 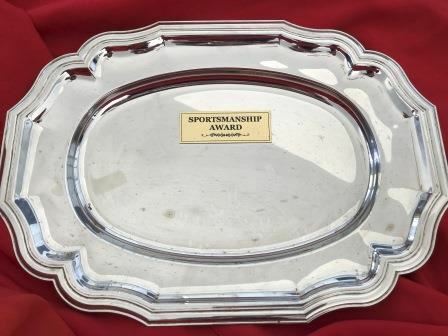 Presented to the Club by Jim Vauthrin, this trophy is awarded for the junior sailor (under 18) with the best sailing performance on and off the water. This award is presented the the High School sailor that performed best throughout the year. Donated by the Bourne family, in honor of Gloria and Jerry Bourne and their lifetime support of Junior Sailing. 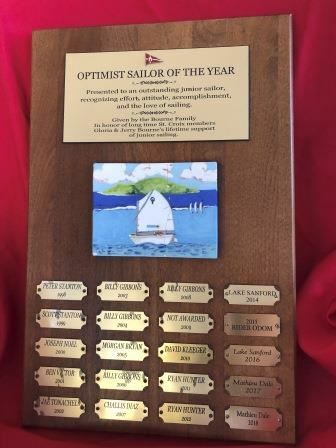 This award is presented to an outstanding Optimist sailor, recognizing effort, attitude, accomplishment and the love of sailing. This award was Donated by St. Croix Marine to the sailors that finish within the top 15% of three or more Major off island Regattas. This perpetual award goes to the sailor of the cruising yacht who has had the best performance for the year either racing or cruising.